Every day at 4:45 pm, the boys come up to the barn for their dinner. 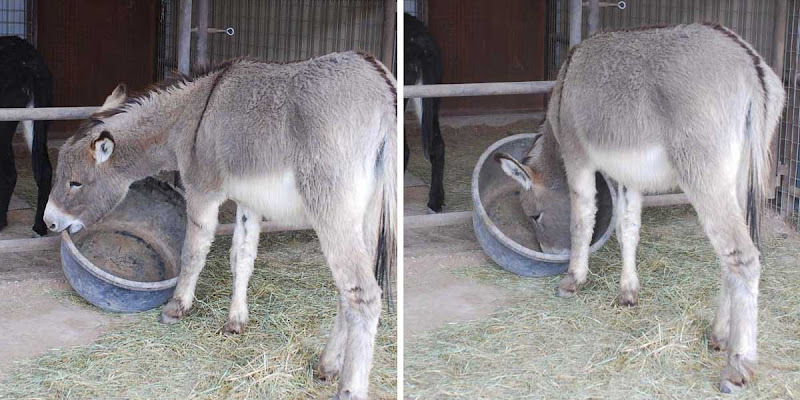 Before they're served their hay, each one gets a measly cup of pelleted feed, just so I have something in which to mix their supplements. George and Alan don't get any supplements, but fair is fair. And this tiny offering is a surefire guarantee that they'll come runnin' home at least once a day. 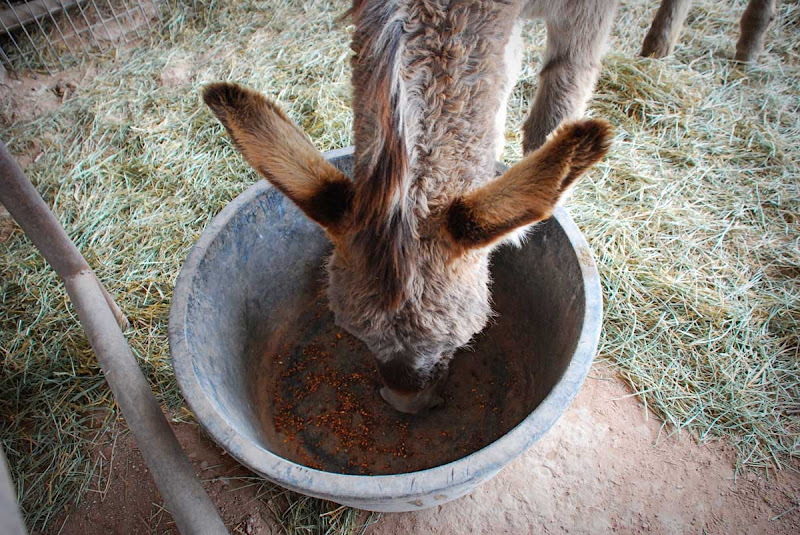 One cup of feed doesn't go very far in a great big tub. But every day, while everybody else peacefully stands and munches, George picks up the tub with his teeth, bangs it against the pipes making a horrendous racket, and tilts it up so he can more easily scarf up every morsel. No, George, you're not getting any more. 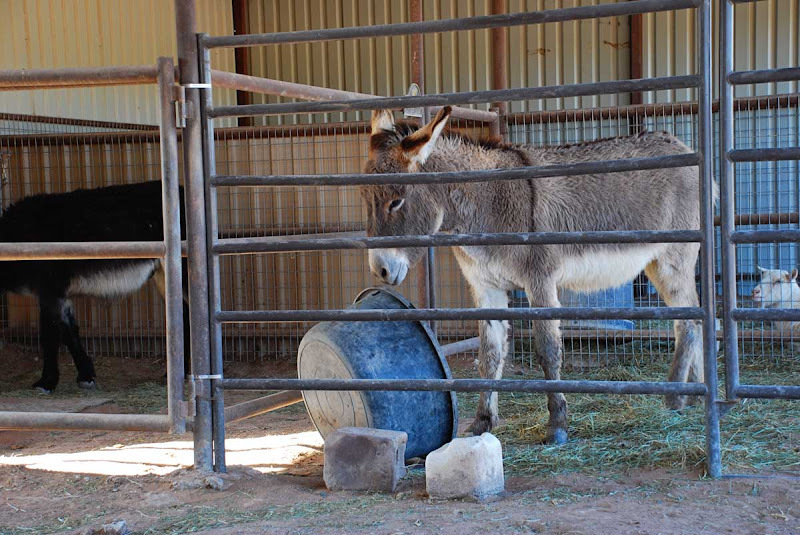 You can't blame a burro for trying. Oh I love that and quite ingenious of him. My little guy only gets a handful, just so he thinks he's getting something. He doesn't seem to mind the other guys get way more, I think he just thinks they are slow eaters. i've said it before and i'll say it again... i just love your animals. my family and i are taking a trip to the southwest for the first time next week. we'll be in phoenix with visits to the Grand Canyon and Sedona. we can't wait! regarding your animals... do they roam free or is your property all fenced? how does that work where you don't lose them or they don't get lost? do they just naturally stick around the yard? i'm sorry if this is a stupid question but i always wonder when you have photos of the animals walking about, i wonder if they ever walk too far that you would then have to go find them. Not to worry, Queenie. 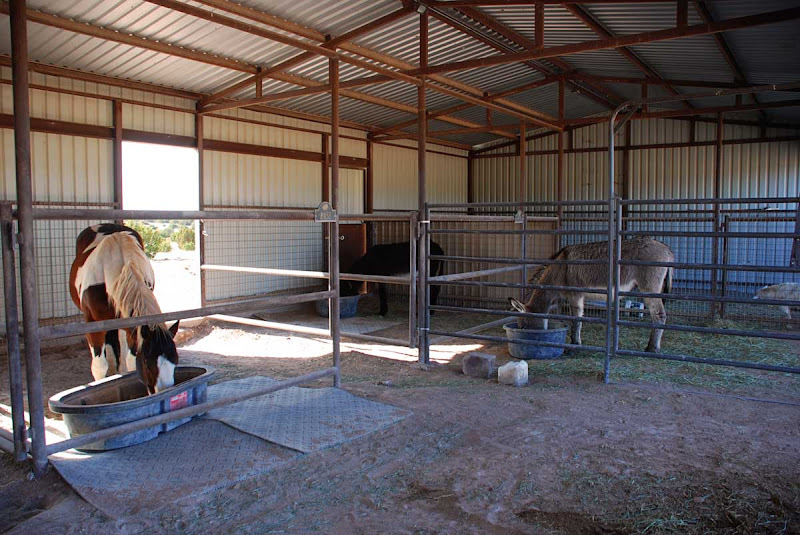 The whole ranch is fenced, so while they are free to roam 24/7, they can only roam so far. I have them whistle-trained, so if ever I can't find them, if they hear my whistle, they'll come running. I love it! Can't fault the guy for trying. My old guy does the same thing...he bangs his feeder so all of his pellets/grain come to the front of the feeder. They're not dummies! I just had to giggle and laugh over George and his antics! I remember your land being fenced in from previous posts, but them coming when you whistle is awesome. 1. 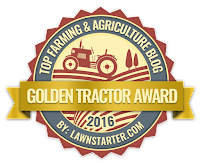 You have a fabulous barn! It looks brand new. 2. You have such well behaved (from where I'm sitting) critters. 3. You have such gorgeous critters. 5. I can relate to the measly helping of grain. I confess, when I'm feeding a 'handful' of grain to the horses I care for, I usually spill a bit more in there for them. I can't help myself, I'm a softy. 6. 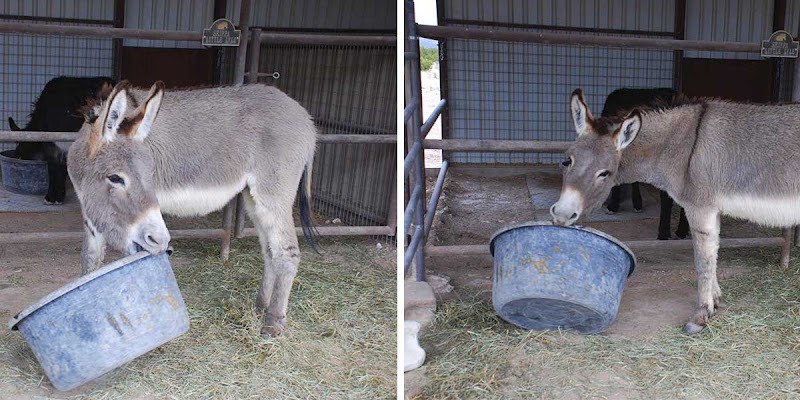 George is one good lookin', clever burro. 7. Damn, you take great pictures, no matter what the subject. I love it...maybe if you gave him a tin cup and he could rake it back and forth over the "bars"? Would that bring some extra chow? NOPE. Same game is played at our house daily...but in the evening. Sure makes them come in from the pasture lickity split, huh? You know....I believe it....but I can't believe how smart George and Alan are. Crafty little critters! Good to the last drop or morsel! Great pictures. Dinnertime is always so exciting for them. 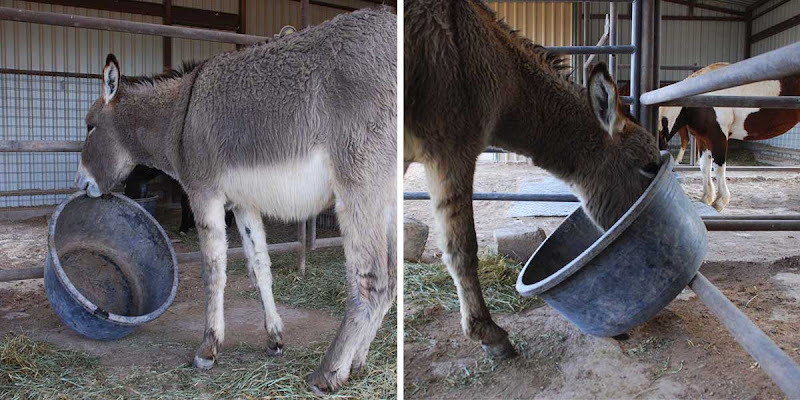 Our paint horse Blue does the exact same thing with his bucket, tipping it to get the good to the last drop feed. 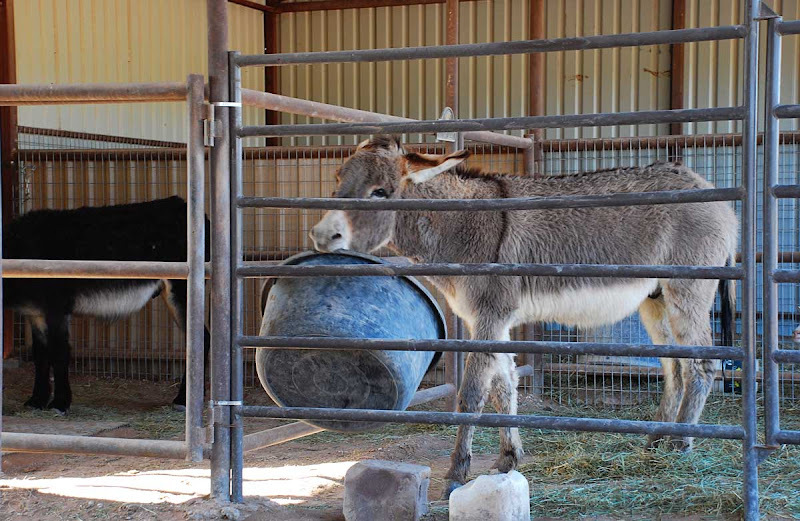 I just love reading about your burros! Aren't they clever? Our thoroughbred, Gigondas, bangs her foot on the railing of her corral to DEMAND her feed! Also, she's learned that after a workout, she gets food! Especially now that I'm on a diet, I share George's pain. I've been known to bang my bowl on the table repeatedly hoping that it magically fills up with something more interesting -- like Rocky Road ice cream! Your blog is an entire world, especially now with your redesign and your devotion to quality updates. I admire your creativity, intelligence and compassion. You also seem to know how to set limits. No doubt learned from corporate experience where individuals disappear without notice, even to themselves. Too funny! He reminds me of my sister's mare. She paws while standing at her bucket, or flips it over the fence..... anything to encourage it to magically fill with grain. Do you have any of those horsey teeter-totter balls for him to play with? George is hilarious! Nothing like a little humor from an animal! Your boys are something else. Applejack (aka Raincloud) always lets me know when he's done his grain. He picks his bucket up and tosses it around. The last side by side photo freaked me out at first. I didn't realize it was Alan's feeder in the background... it looked like something was REALLY wrong with George's right eye!